A problem that’s plagued the literary community for years upon end is the lack of recognition and media attention that black authors get in the mainstream media. Of course big name authors with remarkable PR teams, years of experience and possible backing from a corporate publisher get their just due but what about the independent authors? As social networking has made it easier to connect with our author peers and cultivate nationwide fan bases like never before, it’s also caused the industry to become oversaturated. With over 100,000 books coming out every year, how will yours be recognized? The narrative that’s swept black America over the past year is economic empowerment. Why beg for someone to include us when we are more than capable, with our trillion dollars of spending power, to produce our own? Not everyone is waiting for a handout by the corporate infrastructure. 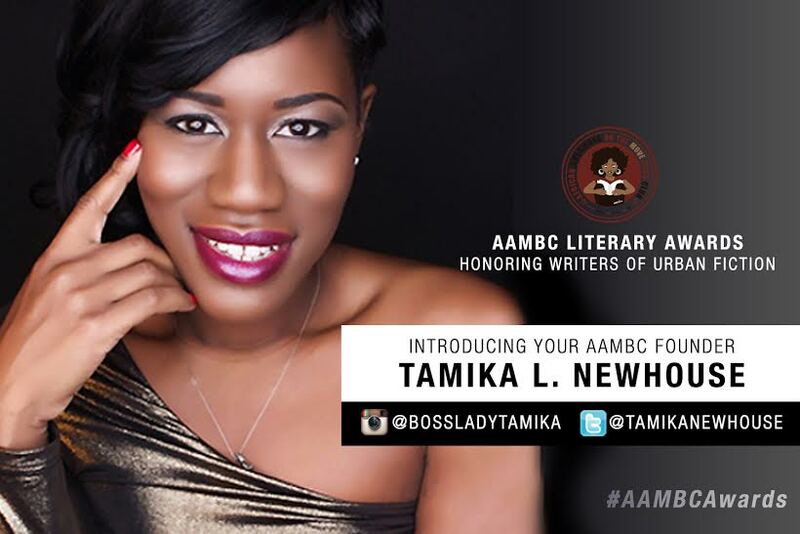 Tamika Newhouse has set up to create a literary based awards ceremony that even rivals that of the music and entertainment industry. Ms. Newhouse is the bestselling, award winning author of sixteen books, most notably The Ultimate No No Series. Her accolades include being honored with the E. Lynn Harris, named after legendary African-American author E. Lynn Harris who left a foot hole in the industry with his innovation before his passing in 2009. Ms. Newhouse is hosting her inaugural awards ceremony for her AAMBC (African American On The Move Book Club) on June 13th at 6:00. Recently, I got a chance to talk about the event and the importance of recognizing African-American authors in an industry that seems to look past them. Tamika Newhouse: The inspiration for the awards show was given to me in response to the irritation of not having a platform that celebrated our writers and their works. We are artists too but we are the last to ever be talked about in mainstream media. We aren’t in or on the cover of magazines, we aren’t on radio shows, we don’t grace the red carpet events, we don’t have billboards or commercials on television but we are indeed artists. Why should these platforms only be given to musicians and actors? Creating the AAMBC Awards is giving African American writers our Grammys. Randall: What differentiates the AAMBC Awards from other literary based award shows such as the African American Literary Awards Show? Tamika Newhouse: My main goal with these awards is to build a consistent platform. Our show is a production that not only is entertaining but we have modeled it to mirror that of the BET or Grammys awards. Our goal is to reflect what is accepted in mainstream media and, with brining that element into play and staying consistent, we plan for the AAMBC Awards to be the mecca event for the black book industry. The award show based in New York lacked consistency and effort to ensure it was a smoothly ran operation. You could see over the years that the quality of that awards show was deteriorating. Randall: How are the nominees and categories chosen? Tamika Newhouse: The nominees are sent in through public suggestions. An open poll is created and we ask the public to submit their favorites. From there our board of directors cypher through the submissions and look at the quality of work, the brand/artist themselves, and collectively go from there. If an author doesn’t campaign for nominees then obviously they more likely won’t be nominated. Randall: How important is winning an award to the career of an author? It is very important nowadays since the word “bestselling” is overused and holds little credit or merit these days. To be able to state that you are an award-winning author is a proud moment. This is one of the reasons why the awards were created. I wanted rising stars to have the chance of being honored with an accolade. Randall: One of your mottos for the awards is that you want to push urban literature to the mainstream. What motivated you to pursue this tremendous feat? Tamika Newhouse: Because it is a hard and tedious feat. Not many people hold a platform or desire to be different and to take on a challenge and I am the opposite of that. I have planned and mediated on developing this show for over a year to ensure it was done correctly. The vision for these awards is to attract attention from mainstream media outlets and be the premiere event for African American writers. Randall: In your opinion, what is a mainstream author and how would an author get to that point in this landscape. Tamika Newhouse: My definition of a “mainstream author” is an author with a consistent fan base, full length quality novels, professional covers and editing. These authors also are incredibly visible, getting out to meet fans and hold events. Being an author is an art and you wouldn’t see someone like Jay Z put out an album and not tour and promote it now would you? An author should look at themselves as a brand and should strive to always ensure they are reinventing themselves with each project. Randall: Does having a contract with a corporate publisher matter in giving an author a mainstream push? Tamika Newhouse: No it doesn’t. Publishing is made easy these days and it doesn’t mean you have a large publishing deal/contract. It’s all about your presentation and your supporters. Many self-published authors sell and make just as much or more as authors with publishing contract with major publishers. Randall: By the time this article is published, it will be read by many young people. What do you say to them? Tamika Newhouse: I was a young dreamer. I had dreamed of being an author when I was twelve. I became a teen mother unfortunately but yet I still launched my company at 20 years old. It all starts with a dream and then you follow up with action. Don’t just sit and wait for an opportunity to come to you; create your opportunity. And don’t say you don’t know how when google can be your best friend. Randall: What’s next on the horizon for your brand? Tamika Newhouse: Well I am launching a few different companies and a web series called Lit Ish. I will begin to plan out the 2016 AAMBC Literary Awards and maintain the launch of Mahogany Red Books. I am also still writing and releasing books yearly.